Thank you for mentoring a pair of 4 year olds! Help students in Northeast Florida prepare for Kindergarten, by being a ReadingPals Volunteer! ReadingPals offers volunteers an opportunity to build meaningful relationships with young children in Florida, while helping them improve their social-emotional development and early literacy skills. Volunteers must be 18 years old or older in order to participate as a ReadingPals Volunteer. ReadingPals was designed by The Children’s Movement of Florida and is currently administered through 17 United Ways with the help of numerous community partners across the state. 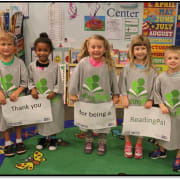 ReadingPals is a volunteer-based early literacy initiative that provides mentors for Pre-K students who may need extra help, utilizing one-on-one or small group settings. To build genuine, impactful relationships between students and our volunteer mentors. To help students build a strong social-emotional foundation through self-awareness, self-management, social awareness, relationship skills and responsible decision-making. To improve students’ understanding of the fundamental building blocks of early literacy. For 30 minutes each week, a ReadingPals volunteer spends time with a pair of preschoolers, reading a book, completing activities, and developing skills that the children will need for success in school. Each child participating in the ReadingPals initiative also receives at least ten books to help build their home library. Although ReadingPals' training typically occurs in our downtown office at 40 East Adams Street, we are happy to bring a training class to your colleagues or friends! Please contact Kayla Williams at kaylaw@uwnefl.org or 904-330-3954 to inquire. Attend a ReadingPals Training and submit information for a background check.